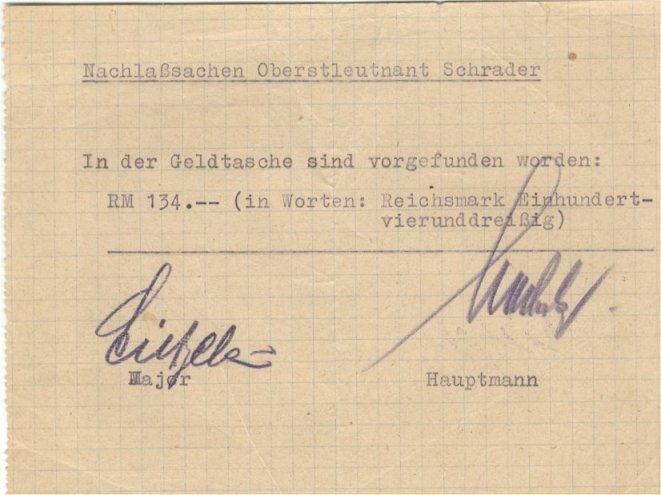 I collect documents and signatures of individuals who were involved in the German resistance movement, especially the July 20, 1944 bomb plot. The collection can be categorized into several general groups including the Abwehr resistance circle, including the Reserve Army Command in Berlin, Army Group Centre, the resistance in Paris, and others. 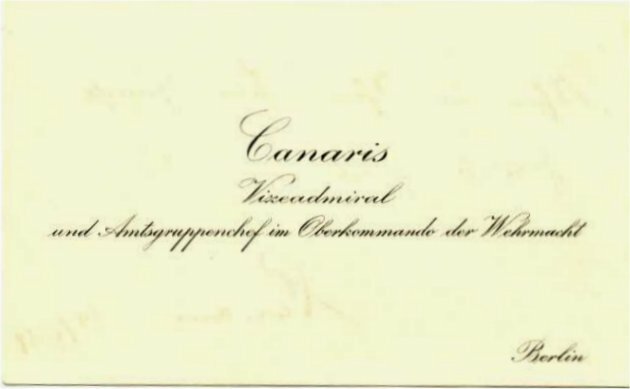 This visiting card of Admiral Canaris includes a signed greeting on the reverse dated May 14, 1938, coinciding with the "May Crisis" war scare over Czechoslovakia. 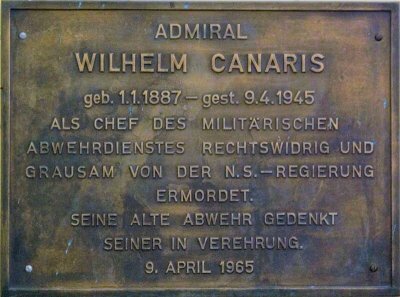 Between 1935 and 1944, Admiral Canaris was head of the Abwehr, the military intelligence service of the Wehrmacht or combined armed forces. Under Canaris' leadership, the Abwehr was a hotbed of anti-Hitler resistance and conspiracy, employing such noted resisters as Hans von Dohnanyi, Hans Oster and Pastor Dietrich Bonhoeffer. Canaris is a controversial historical character who vacillated between active plotting against Hitler's regime and mere tolerance of the conspiracies initiated by his subordinates. Admiral Canaris was arrested in connection with Colonel Claus von Stauffenberg's July 20th, 1944 assassination attempt on Hitler. He survived repeated SS and Gestapo interrogations until early 1945 when his incriminating diaries were discovered in Zossen. On Hitler's explicit orders, Canaris was subjected to a kangaroo court and was executed with Oster, von Dohnanyi, Bonhoeffer and others at Flossenburg concentration camp on April 9, 1945 - less than a month before Hitler's suicide and the official end of the war in Europe. 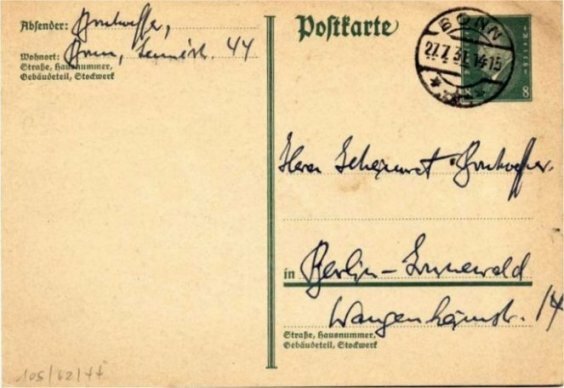 Autographed postcard written by Dietrich Bonhoeffer, dated July 27th, 1931. The text reads: "Dear parents. As Barth will be finishing his lectures tomorrow, I will come back on Wednesday. I don't know the exact train yet. However, it will be sometime in the evening. I got back from Dusseldorf yesterday, where it was very nice. I have to go to the seminar, therefore I don't have much time to write. I am looking forward to seeing you the day after tommorrow. Auf Wiedersehn. Received the corrections and forwarded them." 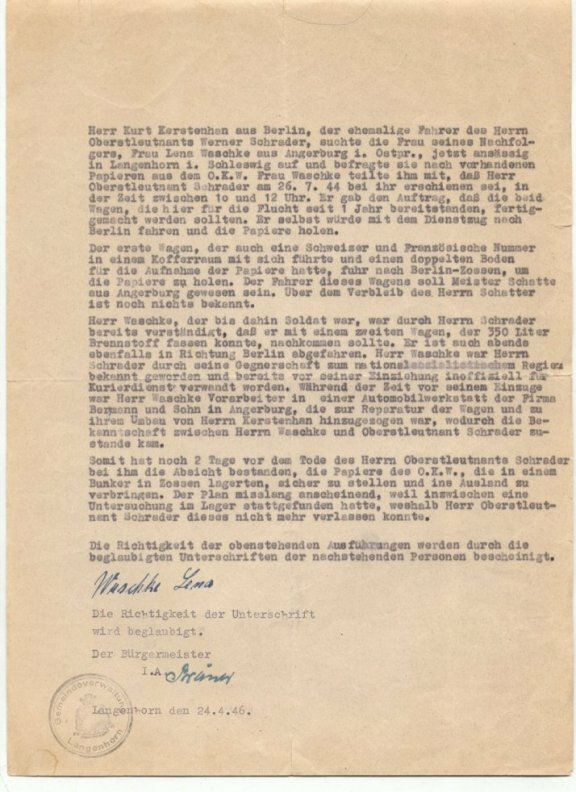 [Note that this document was published in Dietrich Bonhoeffer Werke 11, p. 22 - 23] Bonhoeffer spent the summer of 1931 in Bonn at the Sozietaet Barths. His trip to Dusseldorf was to visit his cousin, Gertrud Wedell, and the "corrections" he refers to were to his post-doctoral thesis, a requirement for commencing work as a university lecturer. Bonhoeffer began his work as a private lecturer on August 1, 1931 at the theology facility in Berlin. Having achieved a status in the Protestant church akin to a Catholic saint, Bonhoeffer is likely the best known of the resisters. 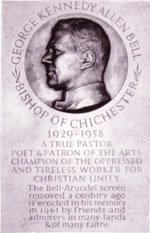 He was selected as one of ten 20th century Christian martyrs to be memorialized on the face of London's Westminster Abbey following its 1998 restoration. His theological and ethical writings are still broadly studied worldwide. Bonhoeffer began his resistance to Hitler early. In company with Martin Niemoeller, he founded the first centre of resistance, the Pastor's Emergency League, later to become the Confessing Church. When Hitler came to power in 1933, Bonhoeffer broadcast a sermon that argued against accepting Hitler's emerging cult of personality. Bonhoeffer argued that only Jesus Christ deserved the adulation Hitler sought. His broadcast was cut off half way through. 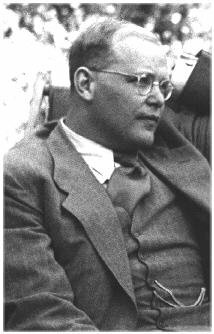 With the assistance of his brother in law, Hans von Dohnanyi, Bonhoeffer was recruited into the Abwehr. This allowed him to avoid service at the front while positioning him well to assist Dohnanyi, Oster and Canaris in resisting Hitler. During his Abwehr career, Bonhoeffer traveled to neutral countries to maintain contacts with the Allies, most notably through Bishop George Bell. He was also involved in Operation U-7, a plot to smuggle Jews out of Germany disguised as Abwehr operatives. Discovery of this operation led to destruction of the Canaris organization and Bonhoeffer's arrest in 1943. After July 20th and the discovery of the Admiral's incriminating diaries, Bonhoeffer was "tried," convicted and brutally hung at Flossenburg Concentration Camp, less than a month before the end of the war in Europe. Thanks for the postings. This is a very unique collection and very different approach. 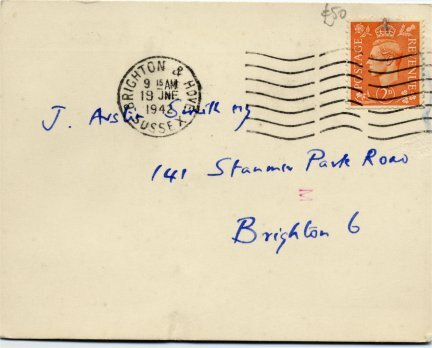 Colin, a very unique and historically important field of collecting you chose. Based on Wiki - Karl Sack (June 9 1896 - April 9, 1945) studied law in Heidelberg where he became a judge in Hesse. He married Wilhelmine Weber and had two sons. In 1934, Sack joined the newly established Reichskriegsgericht (Reich Military Court) where he quickly rose to a senior position. 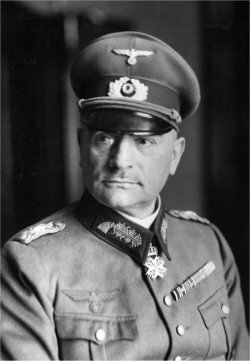 He was able to delay and ultimately assist in derailing proceedings against Army Commander-in-Chief Werner v. Fritsch who had been falsely accused of homosexuality by the Himmler & Heydrich in an attempt to discredit him for his opposition to Hitler's attempts to subjugate the German armed forces. In the fall of 1942, Karl Sack became Judge Advocate General of the Army. During World War II, Sack maintained contacts within the resistance circles in the military, including Admiral Canaris, Major General Oster and Hans v. Dohnanyi, as well as with others within the Abwehr (German military intelligence). He was part of the attempt to assassinate Hitler on July 20, 1944 and after that failed attempt he was arrested on Aug. 9 1944. In the very last days of the war, he was brought before an SS kangaroo court at KZ Flossenburg, sentenced to death and hanged with Canaris, Bonhoeffer and others of the Abwehr resistance cell. Sack had been slated for the role of Justice Minister within a planned post-coup civilian government. 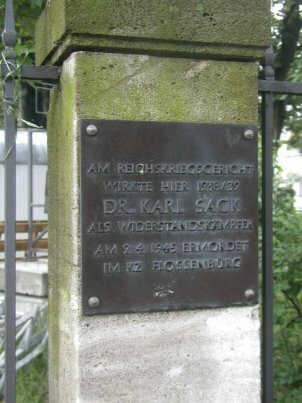 In 1984, Sack's role as a member of the resistance was remembered with a bronze plaque placed in the former Reichskriegsgericht in Berlin-Charlottenburg. There was some opposition to this honour as Sack favoured a far-reaching interpretation of what constituted desertion, which must have led to more than a few death sentences. In Bosenheim, a suburb of Bad Kreuznach, a street has been named in his honour. 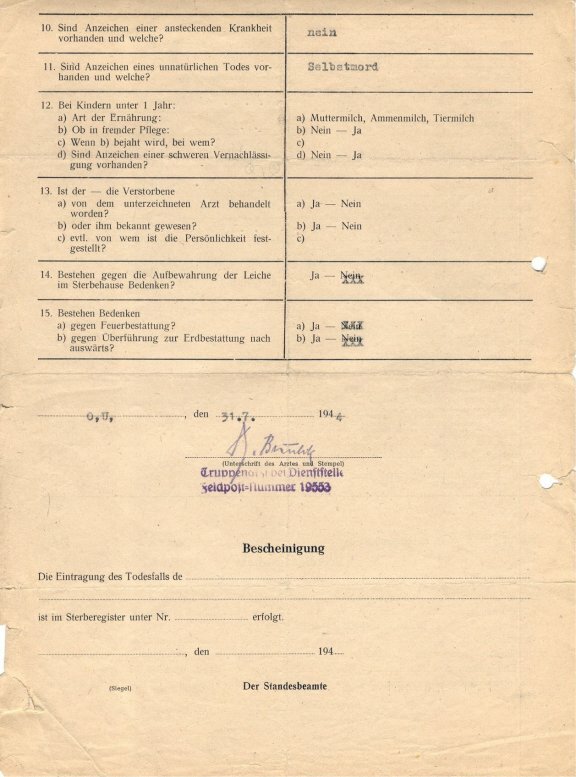 I have several documents (around 50) from the estate of Abwehr Oberstleutnant Werner Schrader. As a result, I have put together a longer bio of Schrader. Although lesser known in history than many of the other participants in the German resistance movement, Werner Schrader was one of the earliest conspirators. He actively resisted the Nazis from Hitler's 1933 accession to power until 1944, when he felt compelled to commit suicide in his quarters. As a key resister, Schrader was intimately involved with several of the most prominent conspirators. And he played a pivotal role in several of the most critical events in the history of the German resistance. Schrader was born on March 7th, 1895 in Rottorf, Germany. He initially trained as a teacher. In 1914, he enlisted in the German army as a volunteer officer and he served throughout the Great War. Demobilized in 1920 with the rank of Oberleutnant, Schrader returned to his teaching career. Between January 1924 and March 1927, he taught history and German at an army technical school in Wolfenbuettel. He also found time to heavily involve himself in the leadership of the Stahlhelm (literally "Steel Helmet"), a nationalistic veterans' organisation politically active in the 1920's and early 30's. In 1927, he rose in the Stahlhelm to a national leadership position as Landesfuehrer or regional leader for Brunswick. Very early on, Schrader ran afoul of the National Socialist Party. He was a leader in opposing the various conservative parties' support for Hitler and he resisted pressures to align the Stahlhelm with Hitler's storm troops, the Sturmabteilung or SA. In October 1931, while at the Harzburg Congress and in Hitler's presence, he spoke out against the excesses of the SA. In common with many other enemies of the party, Schrader was targeted by SA bullies and, in 1933 he was interned in one of the new Concentration Camps. There is evidence that his oppositionist views were cemented by the savage beatings he endured during his time under confinement. Schrader escaped from the Concentration Camp in 1934. After his escape, he rejoined the army as a Hauptmann, with seniority dating from May 1st of 1934. 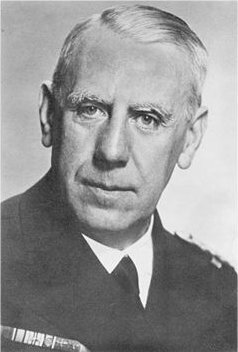 In 1936, when re-arrest looked likely, Admiral Canaris personally recruited him into the Abwehr. Schrader was probably one of the Canaris' first recruits into the military intelligence service. 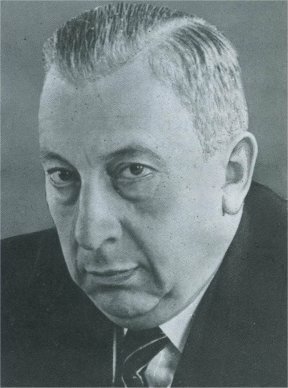 Throughout his tenure as leader of the Abwehr, Canaris selectively recruited anti-Nazis and Jewish officers as a strategy to save them from harassment or persecution by the authorities. Given that all appointments to the Abwehr required vetting and approval by the Gestapo, his efforts in successfully recruiting foes of the regime throughout the years of the Abwehr's existence are impressive. In 1936, Schrader was attached to the Munich Abwehrstelle or "intelligence post," where he met Rudolf Graf von Marogna-Redwitz and other future resisters. By 1938, Schrader was an Abwehr officer assigned to the headquarters of the XVII army corps in Vienna. At this time he began to collect documentary evidence of Nazi crimes. Following the 1938 coup debacle resulting from the Munich Agreement and the resignation of Generaloberst Ludwig Beck, the conspirators regrouped and turned to Beck's successor, Franz Halder, to lead a revolt. A coup was planned for 1939, after the Allies' declaration of war but prior to the commencement of active operations. To assist with coup planning and liaison between the Abwehr and the army, Canaris prevailed on Franz Halder to authorise the creation of an Abwehr presence under Oberquartiermeister IV (Intelligence) at the headquarters of the supreme army command (OKH) at Zossen. This new army section was set up at field post office number 12500, initially under the command of Oberstleutnant I.G. Helmuth Groscurth, the former head of Abwehr group II (sabotage). This unit was known throughout the war as the Abteilung zur besonderen Verwendung ("Special Duties Section"), a sub-unit of the Heerwesenabteilung ("Army Affairs Department"). Groscurth's small section of four officers was staffed entirely by anti-Nazis. In addition to Schrader, its members included Hauptmann Fiedler and Hasso von Etzdorf, who was seconded by Ernst von Weizsaecker from his job at the Foreign Office. One of the section's roles was to liaise between Halder, in his role as Chief of General Staff, and Oberst Oster at Abwehr headquarters in Berlin. But the section's primary task was to support those conspirators within the OKH in organizing a coup against the regime. During his time at Abteilung z.b.v. during 1939 and 1940, Schrader worked to prepare detailed coup plans and briefings for the conspirators. Given the secret nature of these documents, he often typed the material himself. As one of the earliest advocates for assassination, Schrader also worked on options and plans for killing the Fuehrer. Schrader left the section two months before Groscurth's own removal in November 1940. Werner Schrader was promoted to Major on September 1st, 1940, and was returned to the XVII military district and reattached to XVII Corps headquarters as one of its local Abwehr officers on September 27th. By 1941 he was back at the Heerwesenabteilung in Zossen (now under the command of Oberst Radke) where he rose to the command of its Abteilung z.b.V. and the rank of Oberstleutnant by 1944. In 1944, this small department was subordinated the Wessel von Freytag-Loringhoven's Abwehr II. Schrader remained posted to Abteilung z.b.V. until his death. During the 1939 to 1944 period, Schrader acted as the main custodian of various resistance-related files and documents, including those that he had personally collected during his previous posting at OKH. After 1943, he was also responsible for the various documents put together with bureaucratic precision by Hans Oster and Hans von Dohnanyi. Dohnanyi, Dietrich Bonhoeffer's brother-in-law, was a lawyer who effectively acted as Oster's second in command within the Abwehr's administrative group-section Z. This archive included a detailed recounting of the 1938 and 1939 coup plans (with conspirators' names clearly recorded); photographic and documentary evidence of SS atrocities committed in Poland; a mental assessment of Adolf Hitler intended to be used at his trial; evidence of Josef Mueller's and Dietrich Bonhoeffer's respective peace missions to the Vatican and Sweden, and many other documents. The archive was intended to provide documentation for the record, as well as historical evidence that an active resistance had existed at an early date and that it had included significant civilian participation. The resisters were aware that, without documentary evidence of early tangible resistance, the Allies would present the resistance as an opportunistic movement that had only dared or cared to act when Germany seemed likely to lose the war. In addition to these documents, Schrader was personally selected by Admiral Canaris to act as custodian of his own diary. Canaris was careful what he wrote in his diary in 1944 onwards, once he was known to be under suspicion following the arrest of Dohnanyi and Bonhoeffer. He retained this diary in his own possession. However, his diary entries from the earlier years were more explicit in their discussion of his views on Hitler and on his own involvement in the various conspiracies. It appears that about 20 pages of compromising excerpts from the 1943 diaries were held at Zossen in Schrader's safe with the rest of the archives. Two complete copies of the 1938-1942 diaries, amounting to several thousand pages, were entrusted to Schrader. The storage and movement of these documents is an interesting historical question. They were held at various sites at various times and they seem to have been split up or combined as necessary. The earliest material, compiled personally by Schrader, was kept at this mother's house at Gross Denkte. Later, as this material grew in volume and was absorbed into Oster and Dohnanyi's larger collection, some of the material seems to have been kept in Oster's safe in Abwehr headquarters, while most of the older documentation was at Gross Denkte, stored in metal boxes and hidden by Schrader on a farm owned by his brother-in-law, Franz Kracke. 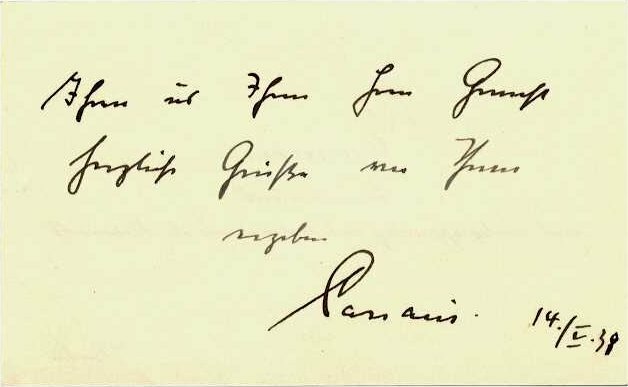 In 1942, it seems that most of the archive, excepting Canaris' diary, was moved to the vault of the Preussiche Staatsbank in Berlin where Oberst Heinz's brother-in-law was the Manager. In 1943, probably after Dohnanyi's arrest and Oster's disgrace and removal, the archive was again moved, this time to a safe in the basement of a Maybach II bunker at Camp Zeppelin in Zossen where Schrader's office was located. Also in 1943, Schrader's son Werner Wolf remembers spending two days in the family's Berlin apartment, helping his father to sift through a copy of Canaris' diary, looking for compromising entries, cutting them out and storing them in yellow paper envelopes. This expurgated copy of Canaris' diary for the period September 1st, 1939 to the close of 1943 appears to have been continually stored at Gross Denkte. 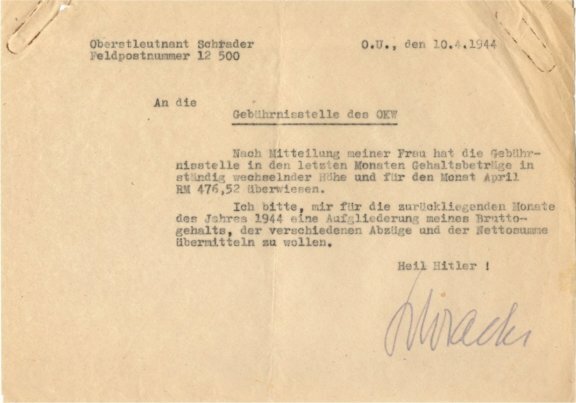 Soon after Schrader shot himself on July 28th, 1944, and fearing another visit from the Gestapo, Schrader's wife, Cornelia, burned this copy along with any other remaining documents from the Oster/Dohnanyi archive that were still stored at Gross Denkte. Werner Schrader was also heavily involved in the procurement of explosive for the conspiracy. 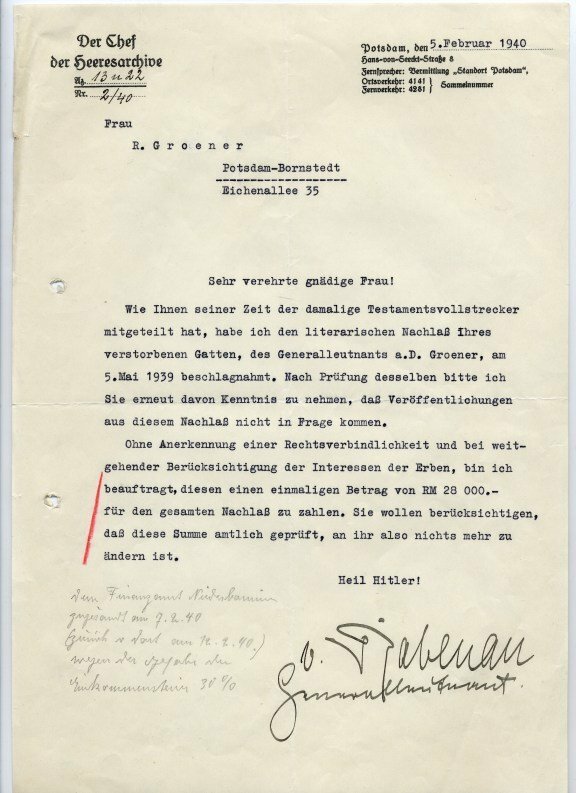 According to the SD reports submitted by Kaltenbrunner to Bormann, he was directly involved in the procurement and delivery of the plastic explosive that Stauffenberg used at Wolfsschanze on July 20th, 1944. Several deliveries of explosive were made to the conspirators over the course of the late 1943 and early 1944. It has never been conclusively determined which was the actual explosive that found its way into von Stauffenberg's briefcase on July 20th. Obviously it was dangerous to be found in possession of such material and the risk of discovery was high given the secure nature of the Mauerwald headquarters. Kuhn enlisted the assistance of Leutnant von Hagen and together, the two buried the bomb, fuses and various other incriminating documents in two holes near a wooden watch tower. 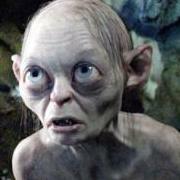 They were spotted digging in the dark by a guard patrol of the 631stGeheime Feldpolizei. A tracker dog was loosed and the explosive was discovered - but Kuhn and Hagen escaped unrecognised. The 631stGeheime Feldpolizei turned the explosive over to the Heerwesenabteilung to complete the investigation. Werner Schrader was put in charge of the investigation by Oberst Radke. He managed to obstruct, delay and eventually completely suppress the official investigation. The explosive material was split in two portions. One half was kept for the SD while the balance was returned to Major Kuhn and the resisters. Schrader is known to have visited his mentor, Admiral Canaris, several times after the latter's removal from command of the Abwehr. On one occasion he briefed Canaris' successor, Oberst Hansen, on the SD's hostile takeover of the Abwehr. On another occasion, in early July 1944, Schrader briefed Canaris on what he knew of Stauffenberg's plans for killing Hitler and bringing down the regime. It is unclear whether Schrader had been specifically briefed or whether he was assuming that an attack was imminent given his June role in providing the explosive material to Stauffenberg. On July 26th, Schrader returned to Zossen with the intention of removing or destroying any compromising records stored there. Based on post-war affidavits and statements, it is possible that he intended to smuggle them to either Switzerland or to Yugoslavia. He brought with him two cars that had been specially modified with secret compartments under the floor sufficient to accommodate all of the resisters' records. They had been sued previously in ferrying the archives to the Berlin bank and to the Maybach bunker. One was driven by Herr Schatte of Angerburg and the other by Herr Waschke, an anti-Nazi mechanic friend of Schrader who had been responsible for modifying the cars with secret compartments and who had occasionally been used as a courier. The plan was aborted when the heavily guarded Zossen complex was locked down soon after Schrader's return, probably as a result of the suicides of General Eduard Wagner and Oberst von Freytag-Loringhoven that same day. Destroying the documents was not an option as the only reasonable method would have been by fire and the volume of material was too great to destroy without drawing unwelcome attention. At 5:30 PM on July 28th, 1944, Schrader put a pistol to his own head and pulled the trigger. He was anxious to avoid arrest and torture and was concerned that he would betray his friends if he fell into Gestapo hands, Perhaps he recalled his experiences with Nazi physical abuse from his time in the concentration camp in 1933. He left a note on the table in his quarters that said "I will not go to prison; I will not let them torture me..."
When Werner Schrader shot himself, he removed the protective umbrella from his loyal driver Kurt Kurstenhan. Kurstenhan was a member of Otto Strasser's anti-Hitler "Black Front," who was released from detention by Schrader in 1939. By all accounts he was completely loyal to his saviour and his family. Kerstenhan was involved in secretly moving the various resistance archives at various times during the war. Released after his late July interrogation Kriminalkommissar Sonderegger of the Gestapo, Kerstenhan returned to the Prinz-Albrecht-Strasse to offer information on Schrader's 1943 transfer of certain documents to a certain safe in one of the Zossen bunkers. Kerstenhan led Sonderegger to the safe. The keys were not to be found so a locksmith from the safe manufacturer was called in. Inside the safe Sonderegger found the complete Dohnanyi archive. As a direct result, the interrogation of the already-arrested Abwehr group, including Canaris, was intensified. Other names were added to the Gestapo's list of suspects including officers not previously thought to be implicated in the bomb plot including: Thomas, Nebe, Wagner, and Brauchitsch. To make matters worse, the Zossen copy of Canaris' diary for 1939 to 1943 was found on April 4th, 1945 when General Buhle was moving his HQ into the Zossen bunker previously occupied by OKH. Buhle had no reason to suppress this find as he had been seriously wounded as he stood beside Hitler in the briefing hut on July 20th. Recognizing the importance of his find, he immediately turned it over the SD. 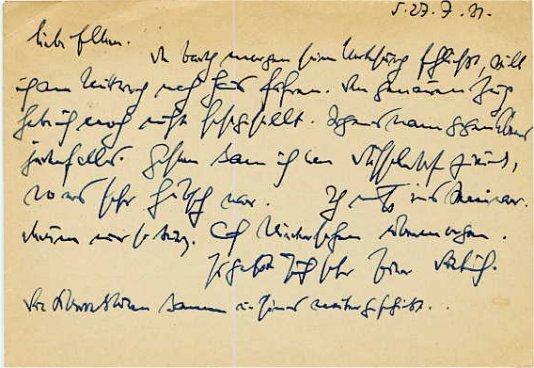 This copy of Canaris' jottings was instrumental in Hitler's decision to order his immediate execution as well as that of the remainder of his group. 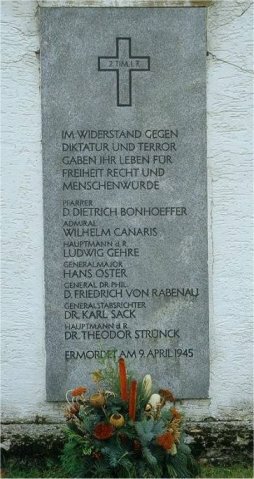 The Canaris group was executed on April 9, 1945 at Flossenburg and Sachsenhausen concentration camps. 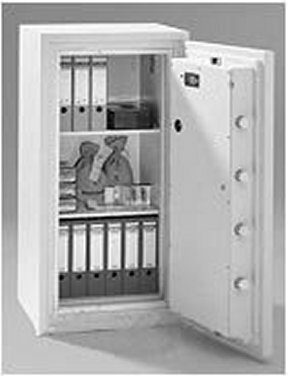 The safe pictured below is a recently installed memorial to the resistance and to the importance of the Zossen documents. Mr. Kurt Kerstenhan from Berlin, the former driver of Lieutenant-Colonel Werner Schrader, visited the wife of his successor, Mrs. Lena Waschke from Angerburg in East Prussia, now resident in Langenhorn in Schleswig, and asked her about some documents from the OKW. Mrs. Waschke told him that Lieutenant-Colonel Schrader had turned up on July 26, 1944, between 10 and 12 o'clock. He gave the order that two cars, which had been kept available for a year for an escape, should be readied. They would drive with the service car to Berlin and get the papers. The first car, which had a Swiss and Southern France registration number on the trunk and a double floor for the inclusion of the papers, was driven to Berlin-Zossen to get them. The driver of this car was to have been Mister Schatte from Angerburg. Nothing is so far known about the current whereabouts of Mr. Schatte. Colonel Schrader had already informed Mr. Waschke, who was up to then a soldier, that he should follow with the second car, which could carry 350 litres of fuel. In the evening, he also drove off toward Berlin. Mr. Waschke had admitted his opposition to the National Socialist regime to Mr. Schrader and was already unofficially being used for related courier services. During the time before he joined, Mr. Waschke was a foreman in the automobile workshop of the firm Bergmann and Son in Angerburg, which had been engaged by Mr. Kerstenhan for the repair and conversion of the cars. As a result, Mr. Waschke and Lieutenant-Colonel Schrader became acquainted. As late as two days before the death of Lieutenant-Colonel Schrader, there was still a plan to move these papers from OKW, which were stored in a bunker in Zossen, safely abroad. The plan apparently failed because an investigation had in the meantime been initiated in the camp and Lieutenant-Colonel Schrader could no longer leave. The signatures of the following persons certify the accuracy of the matters described above. Friedrich von Rabenau ( 10 Oct. 1884 - 15 April 1945) was a German career-soldier, general, theologian and opponent of Nazism. In 1936, von Rabenau was assigned by the then head of the general staff, Generaloberst Ludwig Beck to set up the first central archive of the German army, in Potsdam. Well suited to the task, Rabenau strove to prevent ideological falsifications with a scientific diligence in gathering sources that was second to none. Rabanu was executor to Kurt Schleicher, who biographer he was. His Christian beliefs led him to join the resistance early. 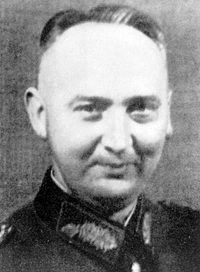 Rabenau was a Rechtsritter in the supradenominational Order of St. John. Rabenau joined no resistance group, though he did act as a conduit between Generaloberst Ludwig Beck and Carl Goerdeler, whom he knew from his time as a Abteilungskommandeur in Koenigsberg. 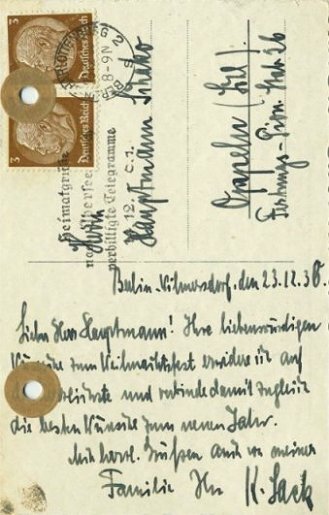 In 1937, Rabenau signed Die Erklaerung der 96 evangelischen Kirchenfuehrer gegen (the Declaration of 96 Protestant Church Leaders Against) Alfred Rosenberg. In mid-1942, von Rabenau was relieved of his office, transferred to the rank of General of Artillerie and sent into premature retirement. He studied Protestant theology at the University of Berlin and in 1943 was made Licentiatus Theologiae, writing his dissertation on military chaplaincy. Rabenau was arrested in the aftermath of the July 20 plot and shared a cell with Dietrich Bonhoeffer. Payne Best, in his book "The Venlo Incident" describes the detailed theological discussions these two, one Catholic and one Protestant - held while confined. Surviving him were his widow Eva Kautz and their two daughters. 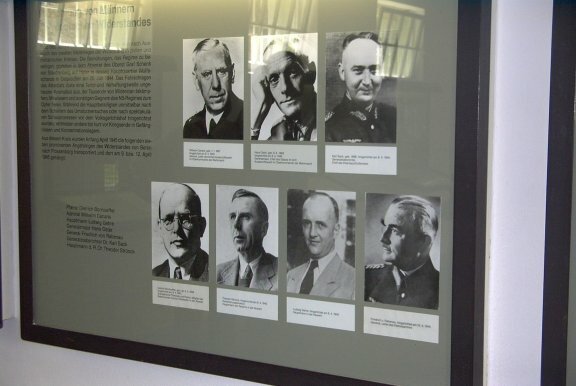 Of the 7 photos shown below of the resisters executed at Flossenburg, Rabenau is bottom right. 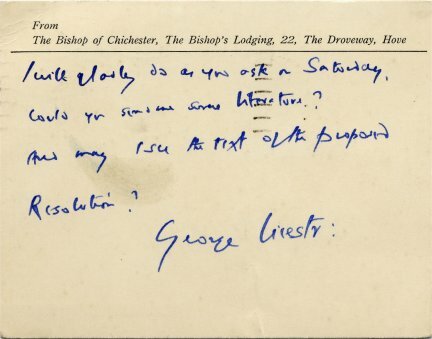 This autographed printed postcard was signed by George Bell, Bishop of Chichester; with a message regarding church affairs; postmarked June 19, 1942 - less than a month after his meeting in Sweden with Dietrich Bonhoeffer. George Bell was a significant actor in the story of the German Resistance, despite the fact that he was an Englishman. He acted as the conspirators' main contact to the British foreign office. 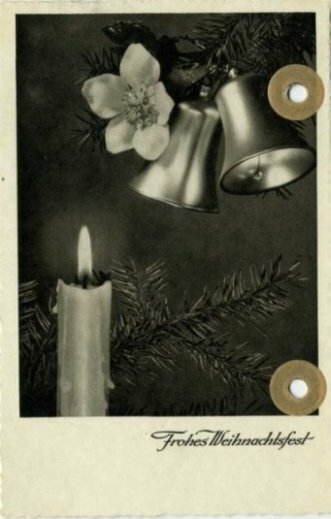 In 1942, Bell visited Sweden and the Canaris group took advantage of this occasion to send Dietrich Bonhoeffer, who knew the Bishop from his pre-war days in London, to make contact. 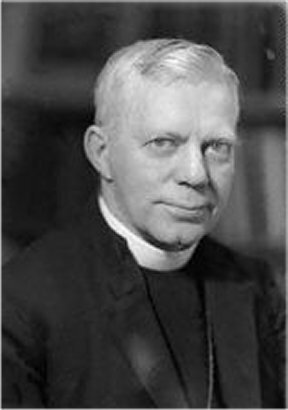 Briefed by Oster and Dohnanyi, Bonhoeffer was tasked to make sure Bishop Bell was aware of the extent of the German opposition. 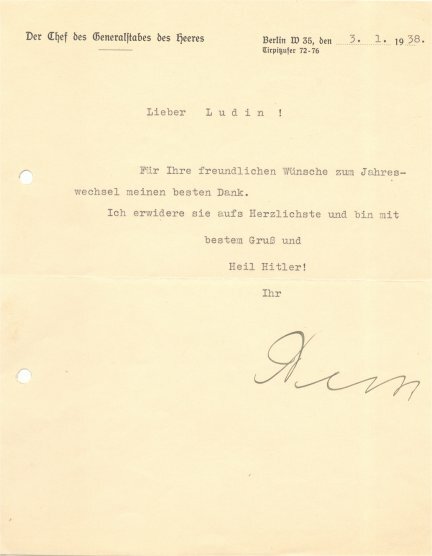 With Beck's permission, he took the risk of passing on the names of the main conspirators as well as a plea for the Allies to accept some framework for negotiations should Hitler be removed from power. Upon his return to England, in late June 1942 Bell summarized his experiences and observations in a report to the Foreign Secretary, Anthony Eden. Skeptical since the catastrophe of the Venlo Incident, Eden dashed the bishop's hopes. On July 17, Eden wrote to the Bishop to say that, while he had no desire to doubt the honesty or credibility of Bell's German contacts, he did not feel that it would be in Britain's national interest to respond. This effectively shut off this avenue of communication. 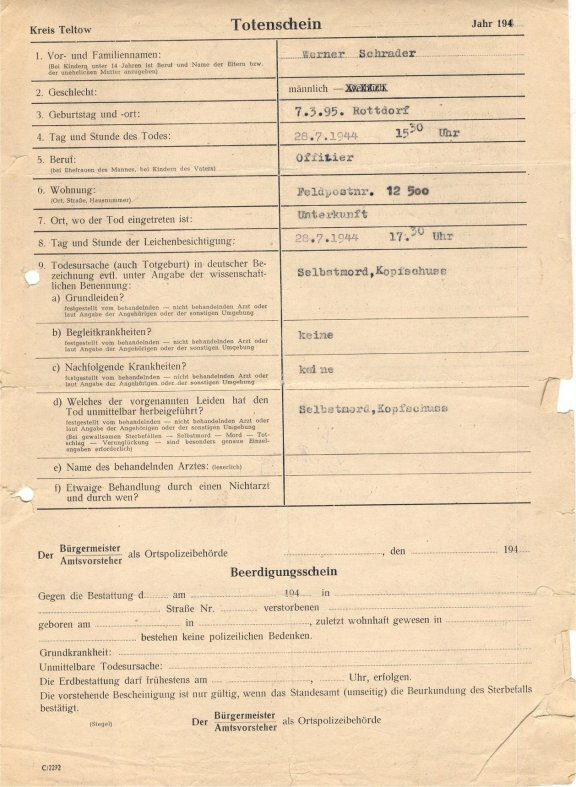 Generaloberst Friedrich Fromm (1888 - 1945) signed this routine piece of military bureaucracy over a signature block consisting of his "Colonel General" rank and under his typed letterhead title as Chef der Heeresrustung und Befehlshaber des Ersatzheeres. In English, this title translates to "Chief of Army Ordnance and Commander of the Replacement or Home Army." The note was likely attached to a memo or report submitted for review and it notes that Fromm has "nothing more to add." Claus Schenk Graf von Stauffenberg was Fromm's Chief of Staff and was acting as Fromm's delegate when, on July 20, 1944, he ignited a time bomb at the Fuhrer's headquarters in Rastenburg, East Prussia. The bomb exploded under Hitler's map table in an outdoor briefing hut, killing four other attendees and injuring the rest. Unfortunately Hitler was only slightly wounded. There is a high degree of evidence that Fromm was generally aware of his Chief of Staff's resistance activities, or at the very least, that he strongly suspected them. At one point, Fromm intimated to the plotters that he would prefer it if the plotters could ensure that Field Marshal Keitel, a mortal enemy, should become a casualty in any coup attempt. Fromm was a consummate politician and did not wholly commit himself to the coup, preferring to sit on the fence and see which way the wind ultimately blew. Upon Stauffenberg's return from the July 20th Wolf's Lair bombing, Fromm refused to firmly align himself with the coup in progress unless he had unequivocal evidence that Hitler was dead. When invited to telephone the Fuhrer's HQ to confirm this fact, he was informed by Keitel that Hitler had survived. He instantly distanced himself from the plotters, recommending that Stauffenberg shoot himself. At this point the plotters arrested Fromm, replaced him with Generaloberst Hoepner, and determined that they could and should proceed without Fromm, thus jeopardizing the coup's chances of success. When the coup unravelled late on the 20th of July, loyal officers freed Fromm. He in turn arrested the main plotters, including Stauffenberg, Haeften, Quinheim, Olbricht, Beck and Hoepner. Possibly to protect himself from future implication by the plotters or to possibly to spare them torture, Fromm declared all but Hoepner guilty of high treason and summarily sentenced them to death, with the sentence to be carried out immediately. Beck was allowed to shoot himself and he did so, receiving the coup de grace from an NCO of the Berlin Guard battalion. 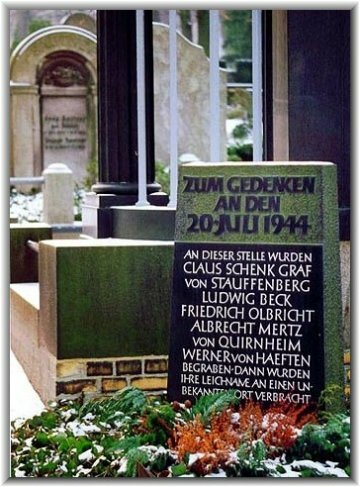 Stauffenberg, Haeften, Quinheim and Olbricht were marched into the courtyard of the Bendlerblock and were shot. Hoepner, who probably had no inkling of Fromm's prior knowledge, was tried before the People's Court and executed by hanging. Fromm did not entirely escape suspicion and he was arrested on Dr. Goebels' order on the evening of July 20th. He was court martialed for breaching court martial regulations during his summary condemnation of the plotters and he was condemned for cowardice, probably as it was deemed that he had shown insufficient resolve in standing up to the conspirators on the night of the coup. In March 1945, Fromm was shot by firing squad, thus escaping the more horrific execution by slow strangulation meted out to the other main conspirators. 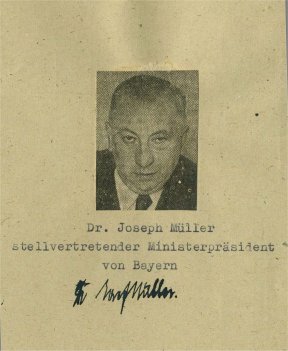 Based on Wiki - Joseph Mueller (27.3.98 - 12.9.79), also known as "Ochsensepp" or Joe the Ox, was a German lawyer and politician, being a founder of the Christian Social Union. During the Nazi period he worked as an attorney defending many Nazi opponents. He also was part of the Catholic resistance and was in contact with resistance figures in the Abwehr (German military intelligence) such as Admiral Canaris, Hans v. Dohnanyi and Hans Oster. Early in the war (1939-1940), Mueller made a number of trips to the Vatican under the identity "X." He carried correspondence between the German resistance and British intelligence that sought co-operation in a coup to replace Hitler's regime with an anti-Nazi civilian government supported by the German military. The correspondence and related intelligence passed through an intermediary to the hands of Pope Pius XII, who would review it and in turn forward it to Lord Halifax in Britain. Dohnanyi summarized the material into a report, containing list of individuals slated to assume roles in a post-coup civilian government and included it in his archive held by Oberstleutnant Schrader at Zossen. Despite Mueller's urgings, the documents was not destroyed and during the purges following the failed assassination attempt on Hitler in July 1944, they fell into the hands of the Gestapo, which led to the arrests, trials and executions of many resistance members. By this time Mueller had already been arrested with Bonhoeffer and Dohnanyi. 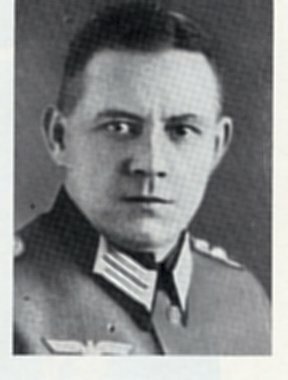 Miraculously he avoided being executed with the other members of the Abwehr circle in April 1945 and was transferred to the Tyrol in late April 1945 along with 138 other "special prisoners" (Sonderhaeflinge) and "kin prisoners" (Sippenhaeftlinge), persons of prominence who were hauled off in the final days of the war to Niederdorf, South Tyrol, where they were to be hidden and used as bargaining chips. They were liberated by the 5 U.S. Army on May 5, 1945. New Year's greeting from General Beck to his friend Hanns Ludin. Signed in person on his letterhead as Chief of the Army General Staff. 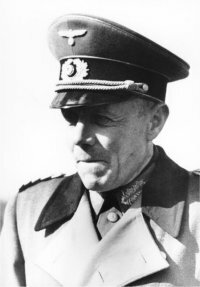 Ludwig Beck, an officer educated in the conservative Prussian military tradition, served as the German army's Chief of Staff from 1935 to 1938. This position allowed him access to Hitler's secret plans and positioned him to serve as the conscience of the German army during the lead-up to the second world war. As a result, he repeatedly warned his colleagues of the likely consequences of Hitler's increasingly risky foreign policy. His professional analyses consistently predicted complete disaster for Germany in case of a major European war. Throughout the summer of 1938, Beck waged an energetic campaign to persuade senior officers of the General Staff to resign en masse after Hitler informed them of his plan to strike at Czechoslovakia. Refusing to collaborate in Hitler's plans for conquest, Beck quietly resigned as Chief of Staff in August 1938, devoting his life to playing a leading role in the conspiracy to overthrow the regime. He was essentially the spiritual father of the Wehrmacht Resistance and, as an adviser to his successor Halder, he was a major player in the aborted 1938 coup attempt. Beck and the conspirators believed that receipt of a clear threat of war from England over the looming invasion of Czechoslovakia, would allow the Generals to mobilize public opinion enough to depose Hitler. Beck and Carl Goerdeler, the civilian leader of the resistance, sent emissaries to the Foreign Office to convince the British to explicitly oppose Hitler. Unfortunately, the prevailing attitude in the Foreign Office at that time was to avoid war at virtually any cost. To their frustration, in September 1938, British PM Neville Chamberlain and French President Edouard Daladier signed the Munich Pact, allowing Hitler to annex the Sudetenland thus precluding a coup attempt. Beck's personality could be summed up by the lines of Kipling's famous poem "If." Every inch a gentleman, he knew how to respect others, and never looked down on simple people. It is said that there was no room for rival egos in his presence and that his sincerity brought unity among conflicting personalities. In his spare time he devoted himself to the study of the history and science of war. He regularly attended the Wednesday Club - an intellectual circle of writers and thinkers opposed to Hitler, including such other resisters as Popitz and von Hassell. He spoke English and French fluently and was well-read in Shakespeare and French literature. After his resignation, Beck placed himself wholeheartedly at the service of the conspiracy throughout its six-year effort. He was on hand in Berlin to help launch the coup during Tresckow's failed March 13th, 1943 Operation Flash attack on Hitler's aircraft in Smolensk. He was also on hand for Gersdorff's abortive March 20th, 1943 assassination attempt to kill Hitler in the Zeughaus. On July 20th, 1944, Beck came to the Bendlerstrasse to make himself available for the expected launch of the provisional government. Beck coached the resisters and urged his colleagues to seize the radio stations with utmost speed so that he could broadcast his speech to the German people announcing the overthrow of the Nazi regime. Following the collapse of the plot, Generaloberst Fromm allowed Beck to attempt suicide rather than face trial and certain execution. After two failed attempts to shoot himself, Beck was given the coup de grace by a sergeant in the guard battalion. Dr. Hans Bernd Gisevius as a witness at the 1945 Trial of the Major War Criminals in Nuremberg said: "Beck confided in me, and during the latter years I worked in very close collaboration with him, and I was by his side until the last hour of his life on 20 July. I can testify here-and it is important for the Tribunal to know this-that Beck struggled again and again with the problem as to what a chief of the General Staff should do when he realized that events were driving toward a war. Therefore I owe to his memory, and to my oath here, not to conceal the fact that Beck took the consequences of being the only German general to relinquish his post voluntarily, in order to show that there is a limit beyond which even generals in leading positions may not go; but at the sacrifice of their position and their life, must resign and accept no further orders. 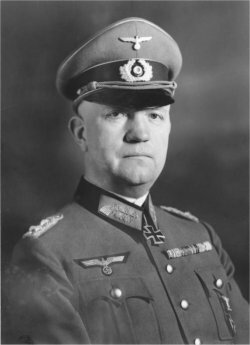 Beck was of the opinion that the General Staff was not only an organization of war technicians; he saw in the German General Staff the conscience of the German Army, and he trained his staff accordingly. He suffered immensely during the later years of his life because men whom he had trained in that spirit did not follow the dictates of their conscience. I owe it to this man to say that he was a man of inflexible character." Fantastic collection and very original collecting field! This is one of the most interesting threads we have had here this year! I had the pleasure of indexing many of Bonhoffers' papers in grad school some 15 years ago. Thanks for you kind comments. This is a great site - a place to profile some very honourable and courageous men and women in a gentlemanly environment. While I won't claim that all of the people who were involved in the various coup attempts were heroes, I admit I admire many of them, especially Henning von Tresckow! They have been strangely overlooked by history here in the West. I guess we can thank Mr. Cruise for correcting that to some degree. I have over 100 books on the topic and well over 100 documents so more to come. Had they succeeded, I wonder what would have happened? Q. So you mean it was good that the Attentat (i.e. assassination attempt) failed? A. NvS -Yes, but even if it had succeeded, I don't know how he (i.e Claus) would have coped. All in all, seen from afar, it was best that the business ended as it did." A. NvS - I mean, if the Attentat had succeeded, the 'stab in the back legend' would have gained currency once again.And then, disappointment was sure to follow, for the Widerstand (i.e. resistance) brought together very different people who, after a successful Attentat, would at once have split into many groups. There would have been endless wrangling. My husband was spared all that. What a wise and accepting woman she was!